After a few days of subtle “What’s going on?…So like, really, what’s going on?” I found myself in a very legalistic position of “I can’t do that.” or “Don’t tell me.” My heart sank a little when my supervisor at work asked me to post something on my work Facebook page. I appreciated her support when she allowed the posting to be delayed until another co-worker could post it. My #NoFBNov participants reported missing out on births, health concerns, and death notices. There were a few reports of hurt feelings that were most accurately described as feeling “invisible”. Add a thin barrier to being able to contact someone–and it becomes very easy to choose not to contact someone. There were also more subtle barriers created by not being on Facebook–many people would assume that you would know about something because it was posted on Facebook. One #NoFBNov participant noted, “I’ve pretty much stopped talking to everybody.” While another stated that it was funny how much texting even slowed down–because a lot of the time texts spawn off of what is viewed on Facebook. I don’t think Facebook makes us more lonely…if you’re lonely, Facebook can highlight that loneliness…if you’re happy Facebook can enhance that happiness. If you don’t give a flip, then no flips are given. According to participants they were able to be closer to the people who mean the most–family and friends. Netflix and I got really serious for awhile…then I discovered Amazon and I re-watched every episode of Flight of the Conchords. Most importantly–my time spent with my children had minimal interruptions. My children said cute things…and they stayed between me and God…well…okay I did text some people some of their cute quotes. There were thoughts that sat in my journal and stayed within my head. Coming back to social media really has interrupted some of that positive that I was enjoying…During the month of December I’ve attempted to establish social media activity at a level that I find tolerable…something that adds to my life instead of distracts…but it’s none of those things. I’ve returned to a social media filled with social injustice…and sometimes that overwhelms me. Grief, intolerance, inequality, poverty, racism, torture…it just gets more exhausting. And no matter what…I feel reminded that I’m not doing enough. Facebook is this weird place where aggression is unleashed alongside cute puppy pictures. Sometimes I feel cynical, defeated, and an incompetent sharer of unpopular opinions. My darkest days in November are light in comparison to the darkness I’ve seen in December. This space represents one significant minute when I clicked away from writing this blog and onto FB. And sometimes something hilarious happens so everything feels light again, and you can’t even. 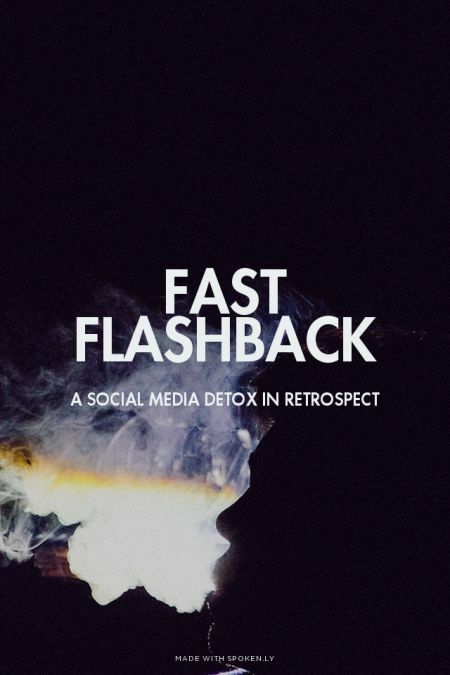 This is what I think…if you don’t believe you could endure a fast from Facebook–then you should try it. At least long enough to identify any unsavory habits that you may want to eliminate. Will my New Year’s resolution have anything to do with detoxing from social media? Nope. The spread of love with word is silenced in mind without deed. No action, no legitimacy. Fear spreads with word and requires no action to be effective. Fear destroys with no action. Appetites are not satiated by eating. Acceptance is not felt through comments. Sharing is acceptance. Acceptance is a shared meal. Life is not lived on a timeline it is a circle full of engagement and interaction between moments of solitude. If we judge ourselves by what we allow, can we also allow ourselves to truly judge the depth of what we allow? Awareness of weakness is not a weakness. So do you know someone who needs a break from social media? If you’re judging someone else’s need for a social media break–then it is probably you that needs to take the break. Just sayin’. Introducing my good friend Jeanna, the Writer. Also a wonderful mother of 2 awesome little boys (who I was blessed to care for during their earliest years). Read about her reflection on going without social media for a month. It is amazing how much our eyes can be opened when we remember to look up. The often elusive feeling-of-peace-and-rest can be experienced when we allow ourselves to focus on affirming the person in front of us instead of receiving affirmations from those far removed from us.